Home	/ Musings / The exciting last few days! The exciting last few days! The last few days have been very exciting. Last Sunday, I was at Nagpur to speak and interact with students of engineering. This was my first visit to this city and I was impressed with the small but busy airport and the broad and well laid out roads. The traffic for once seemed so well-behaved compared to our own Mysore or other similar sized cities. The students had come together under the banner of Abhyudaya and this event was the culmination of a week-long celebrations. The celebrations were not about music, dance and other such cultural events. It was about Nation Building. They had debates, innovations for solving India’s rural problems and other related themes – all centering around India and her development. 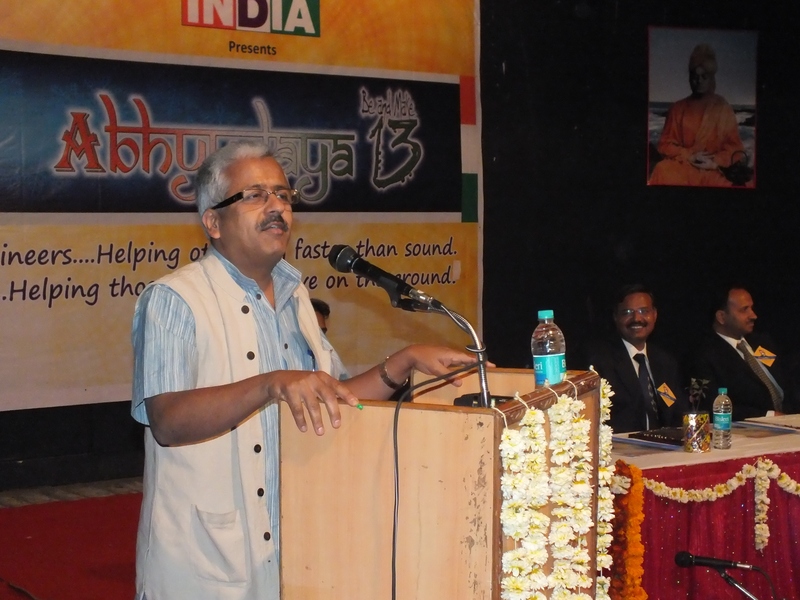 Abhyudaya was about engaging these young men and women participating and contributing to the country’s progress. It was about inspiring them to seriously consider social careers. I was impressed by their commitment and social concern. The interactions with them were indeed energizing. It is always so morale boosting to talk and interact with such vibrant and enthusiastic young people. I also used the occasion to share the message of Swami Vivekananda and his clarion call to the youth. Abhyudaya seemed such a wonderful way of celebrating Swami Vivekananda’s 150th birth anniversary. On Monday, I had another surprise awaiting me. 29 years ago, in December of 1984, I had applied for 12A registration and 80(G) tax exemption certification for SVYM at the Income Tax office in Mysore. I have narrated the story of how I went about it in an earlier blog: The incredible story of how we got our 80 (G) exemption. Mr Padmanabha, the Income Tax inspector who had helped me then and whom I had briefly met 20 years later had since retired. He had met with one of the present Income Tax officers, Mr Girish and their conversation had a passing reference to SVYM. Mr Padmanabha had recollected his interactions with me and expressed a desire to see me. Mr Girish promptly contacted Krishnamurthy (our Finance Officer) and decided to visit me at V-LEAD immediately thereafter. Both of them came and we spent some wonderful and nostalgic time talking about those early days. Mr Padmanabha was able to recollect most of the conversation that we had 29 years ago. He was happy that I still remembered him and his support and contribution to our cause. Looking back brought me memories of those early days and the all the wonderful people I met and interacted with. It was indeed so wonderful to have had so many good-hearted men and women quietly support us and our work. But for all of them, we wouldn’t have grown and done so much.